Back in 2006 Nicole Richie appeared in a Harper's Bazaar special feature about Hollywood stylist Rachel Zoe's fashionable life. The special feature included pictures of Nicole Richie at Rachel Zoe's birthday bash. Nicole wore a stunning silver mini dress by Anna Molinari. 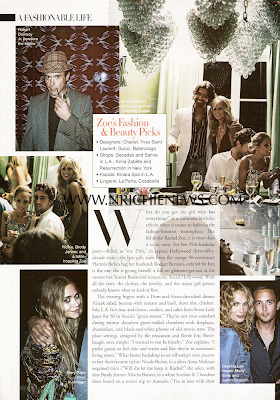 Mischa Barton, Lindsay Lohan, Carlos Lopez and Brody Jenner all featured alongside Nicole Richie in the Harper's Bazaar : A Fashionable Life article. I'm totally in love with this anna molinari dress!!!!!!!!!! I am in love with the dress too! do you know if there is anywhere i cant purchase it?